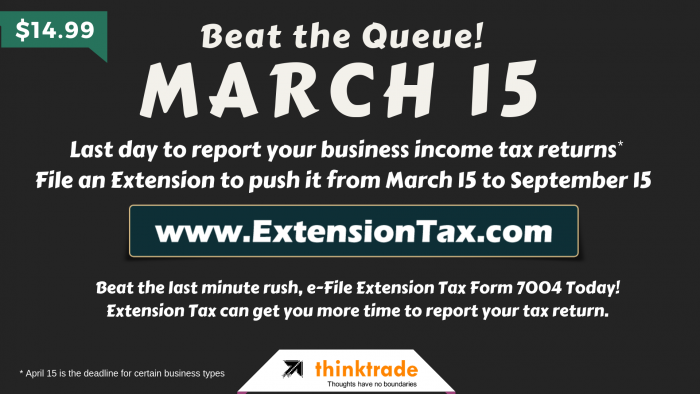 E-File your Business Income Tax Extension Now! “Its tax time again, Americans: time to gather up those receipts, get out those tax forms, sharpen up that pencil, and stab yourself in the aorta” – Dave Barry. It is not at all wrong to have a thought to file your business income taxes on time, but one should make sure that they file it correctly with all the required supporting documents & pay their taxes on or before the deadline that falls on March 15th to safeguard themselves from IRS penalties & interests. Only very few have all the necessary documents handy to submit their Business Income Taxes on time. What about Others? This entry was posted in Efile Extension, efiling, Extension Tax, file extension online, Form 7004, IRS Extension, Tax Extension and tagged April 15, Authorized Efile Service Provider, Business Income Tax, Easy Extension, Efile 2350, Efile 4868, Efile 7004, Efile 8868, Efile Extension, Efile for an Extension, express extension, Extend your Deadline, Extension of Time, Federal Income Tax Extension, File Later, File Taxes later, Form 2350, Form 4868, Form 7004, Form 8868, Income tax Extension, IRS Extension, March 15, May 15, Online Extension, Pay Later, Personal Income tax, Six months Extension, Tax Return Preparers on March 11, 2019 by TaxExpert. The March 15th deadline to file your business income tax return is almost here. Have you filed your return yet? There is still some time left. Maybe you’re still waiting on documents, or maybe you’ve just been too preoccupied with work and life to prepare your return. Whatever the reason may be, the IRS will grant you tax extension to file your return in case you are not ready. If you need more time to file your taxes, you should definitely request an extension sooner than later. It’s always better to extend than to file an incorrect return and have to amend it later. With that in mind, it’s important to note, filing an extension grants you additional time to file your return, but not to pay the tax due. If snail mail isn’t your thing, you can e-file your extension using www.ExtensionTax.com and make an estimated payment online using IRS Direct Debit Payment Option. 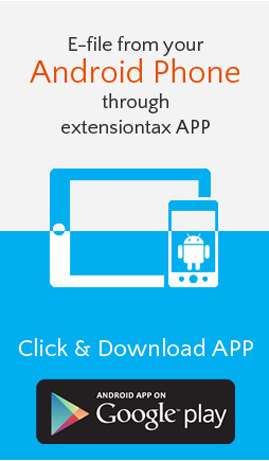 ExtensionTax offers a secured service that lets you pay directly from a checking or savings account, and will send you an instant confirmation that your extension request was accepted and your payment was submitted. Just make sure you choose the correct form and tax period to let the IRS know where to apply your payment. It is challenging to calculate the estimated amount-due to be paid if you’re not prepared to file, but if your tax situation has not changed much since last year, you can send the same estimated amount with your extension tax form 7004 and extend your filing date. 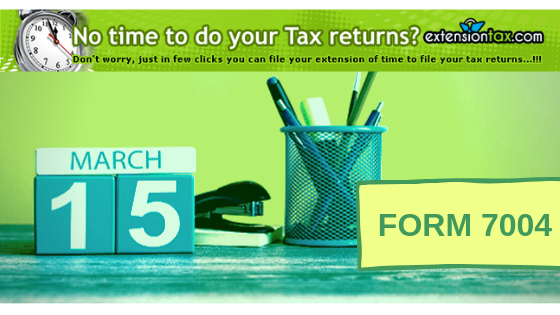 If you didn’t file for an extension by March 15th deadline, your extension request won’t be accepted by the IRS. So just do whatever it takes to e-file your 7004 return right away, the sooner the better. Remember, a return that is filed even one day late is considered late and the penalty will be levied by the IRS. Don’t waste several thousand dollars that you would likely owe in penalties if late, e-file Form 7004 for just $14.99 and take some extra time to review your return to make sure everything is complete before sending it in. Talk to us at 1-866-245-3918 (toll free) for any assistance or write to us in support@extensiontax.com. This entry was posted in Efile 7004, Efile an Extension tax, Efile Extension, efile extension form, efiling, Extensiontax, file extension online, Form 7004, Get instant Extension, IRS Extension, Tax Extension and tagged Authorized Efile Service Provider, Business Income Tax, Efile 7004, Efile Extension, express extension, Extend your Deadline, Form 7004, Tax 7004 on March 7, 2019 by TaxExpert. You know how it feels when you know the time is running out but the paper works are still incomplete. At this point, how to prepare tax return and record it before the deadline is the most vital thing tax payers confront with. Well, the same thing happens to almost 90% of all the tax payers and they elect to e-file Tax Extension to request for an extension of time to file tax returns. Businesses that needs more time can request a tax extension with IRS Form 7004, due March 15, 2019 or April 15, 2019 (depending on the type of business). Business extensions are automatic, and you don’t need to provide a reason for requesting more time. Depending on the type of business, the IRS allows 5 or 6 month extension period, starting from the date the tax return was originally due. For example, if a business obtains a 6-month extension and its original filing deadline was March 15, its new filing deadline is September 15. If you are planning to e-file Form 7004 to extend your filing deadline, the fastest way to do it is e-file through www.ExtensionTax.com. 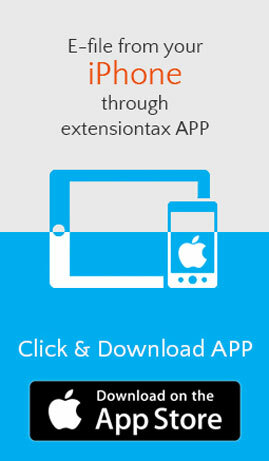 www.ExtensionTax.com is an IRS authorized e-file service provider as well as faster and simpler compared to traditional paper filing. We also make it possible to go through the step by step procedure, and we could do all sorts of math and calculations in the event that you enter your information. Since it’s an online based e-file solution, you don’t require any software installation and you could complete your e-filing from anywhere within minutes. IRS would instantly accept your extension electronically and send you an acknowledgment through email. If you have any questions about e-filing your Form 7004 with www.Extensiontax.com, contact our Experts @ 1-866-245-3918 or write us in support@extensiontax.com. 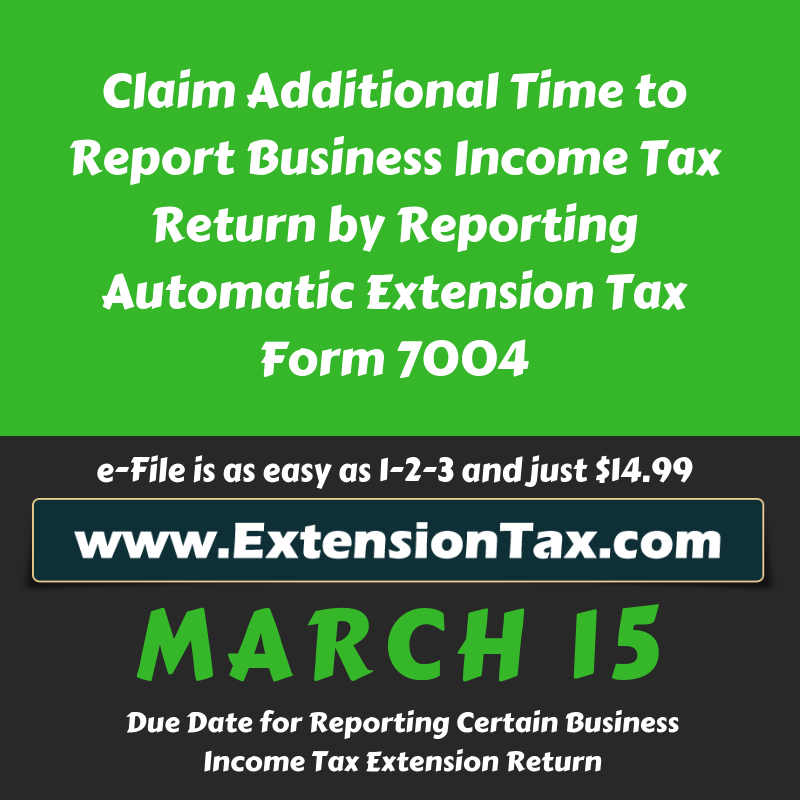 This entry was posted in Efile 7004, Efile an Extension tax, file extension online, Form 7004, Online Extension, Tax Extension and tagged business tax extension form 7004, E-file, e-file extension, Form 7004, How to eFile Form 7004?, IRS form 7004, When is Form 7004 Due?, Where to eFile Form 7004? on March 1, 2019 by TaxExpert.